As rumored back in October, Cartoon Network has announced that they’ve ordered a new animated featuring the Justice League from DC Comics — Justice League Action. Batman: The Animated Series star Kevin Conroy will return to play the caped crusader and Mark Hamill will play his arch-nemesis, The Joker, once again. The world’s greatest Super Heroes return to television in Justice League Action, an all-new quarter-hour animated series from Warner Bros. Animation coming soon to Cartoon Network. The new series is the first DC Comics-based franchise to launch on Cartoon Network since the highly-successful Teen Titan Go!, which in 2015 ranked as a Top 5 animated series among Kids 2-11, 6-11 and all key Boys. Teen Titans Go! also ranks as Cartoon Network’s #1 property for cross-platform video plays and on VOD. 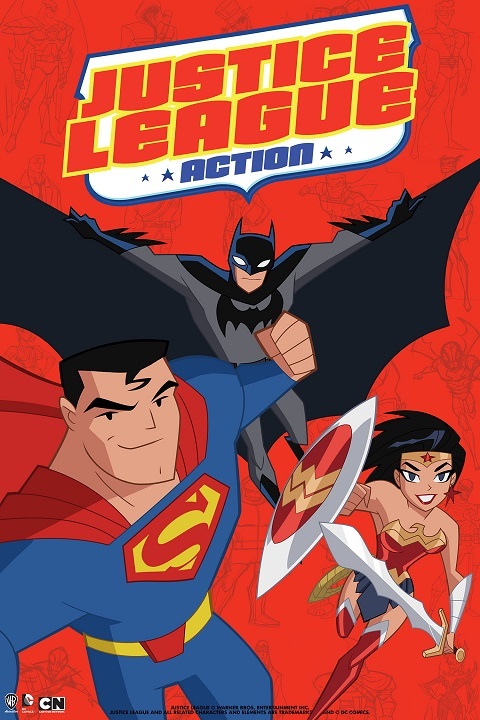 Justice League Action marks the return of Kevin Conroy (Batman: The Animated Series), beloved by fans worldwide as one of the most iconic voices of Batman, to a weekly-animated television series. The series will also deliver an all-star lineup of regular and guest cast voices, including Mark Hamill as Joker, James Woods as Lex Luthor, Diedrich Bader as Booster Gold and many more portraying your favorite DC Comics Super Heroes and Super-Villains. Sam Register (Teen Titans Go!) serves as executive producer with Butch Lukic (Justice League, Batman Beyond), Alan Burnett (Batman: The Animated Series) and Jim Krieg (Green Lantern: The Animated Series) serving as producers. Cartoon Network (CartoonNetwork.com) is Turner’s #1 ad-supported cable network with Kids 6- 11 in the U.S., with a global offering of the best in award-winning animated entertainment for kids and families across multiple platforms. Available in 192 countries and over 370 million homes, Cartoon Network takes its responsibilities to its audience seriously by embracing key social issues affecting families with initiatives such as Stop Bullying: Speak Up. Turner, a Time Warner company, creates and programs branded news, entertainment, animation and young adult media environments on television and other platforms for consumers around the world. Warner Bros. Animation (WBA) is one of the leading producers of animation in the entertainment industry, producing and developing projects for multiple platforms, both domestically and internationally. WBA’s TV series include Be Cool Scooby-Doo!, Teen Titans Go!, The Tom and Jerry Show and Wabbit – A Looney Tunes Production for Cartoon Network, the upcoming Bunnicula for Boomerang, Mike Tyson Mysteries for Adult Swim and the forthcoming Green Eggs and Ham for Netflix. As the home of the iconic animated characters from the DC Comics, Hanna- Barbera, MGM and Looney Tunes libraries, WBA also produces highly successful animated films – including the DC Universe Animated Original Movies – for DVD. One of the most-honored animation studios in history, WBA has won six Academy Awards(R), 35 Emmy(R) Awards, the George Foster Peabody Award, an Environmental Media Award, a Parents’ Choice Award, the HUMANITAS Prize, two Prism Awards and 20 Annie Awards (honoring excellence in animation). DC Entertainment, home to iconic brands DC Comics (Superman, Batman, Green Lantern, Wonder Woman, The Flash), Vertigo (Sandman, Fables) and MAD, is the creative division charged with strategically integrating its content across Warner Bros. Entertainment and Time Warner. DC Entertainment works in concert with many key Warner Bros. divisions to unleash its stories and characters across all media, including but not limited to film, television, consumer products, home entertainment and interactive games. Publishing thousands of comic books, graphic novels and magazines each year, DC Entertainment is one of the largest Englishlanguage publishers of comics in the world. What do you think? Do you plan to check out this new Justice League TV series? More about: Batman: The Animated Series, Cartoon Network TV shows: canceled or renewed?, Justice League, Justice League Action, Justice League Action: canceled or renewed? We (both grandsons and myself) are very excited that Justice League is returning! We really like young justice when it was on.